The three UCLA basketball players who were caught shoplifting in China are back in the US and have been suspended indefinitely from the team. According to their coach, “They will have to earn their way back.” President Trump tweeted the players were set for 10 years in jail if he hadn’t intervened with the President of China. All three players, LiAngelo Ball, Cody Riley and Jalen Hill, thanked President Trump for helping them out of the situation. In the NBA, the Philadelphia 76ers have been transformed. Their young team, led by Joel Embiid and Ben Simmons, is causing a stir in the League. Embiid put on a show Wednesday night in Los Angeles in a big win over the Lakers with 46-points, 15-rebounds, seven-assists, and seven-rebounds. 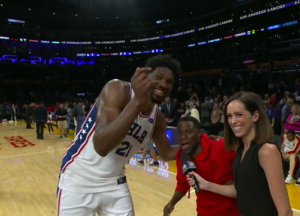 After the game, Philly fan Kevin Hart, ran over to Embiid gave him a big hug and later tweeted “Trust the PROCESS!!!!! A healthy sixers team is a problem for the NBA!!! It’s all about growth!! !” 76ers 115, Lakers 109.